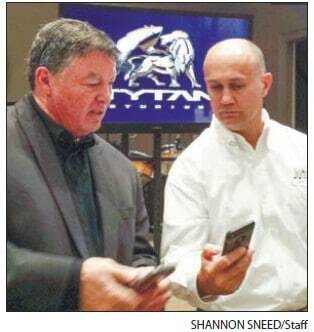 Tytan CEO Jim Stone and Evan Minster of Juturna Water share information from their phones at a Greene-Putnam Rotary Club meeting Jan. 10. Rotary Club of Greene and Putnam Counties’ guest speaker, Tytan CEO Jim Stone, told Rotary Club members about some of the local production company’s goals and visions for movie making. At the luncheon, the producer showed a video of the company’s work, which included highlights of Putnam County locations and local talent. “My life purpose is to inspire people to see the world from a different angle,” Stone said. “That’s the power of film.” He noted that one of his goals was to make Lake Country a destination for faith-friendly, inspirational films. Explaining the company’s makeup, Stone said that it consists of three tiers, including Tytan Pictures, Tytan Studios and Georgia Entertainment and Arts Readiness. 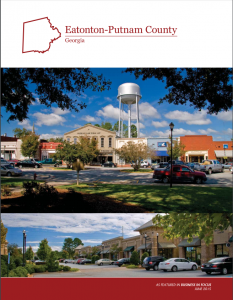 Tytan Pictures is the production side of the company, which does the filming; Tytan Studios is the location, which includes the former state prison in Eatonton; and GEAR is an education program targeting all ages that are interested in the media business.